With the second practice session beginning calmly enough, a spate of crashes in the final minutes of FP2 saw drama wrap up the first day of action as first Marc Marquez (Repsol Honda Team) slid off at Turn 10, before teammate Dani Pedrosa suffered an unbelievable highside at Turn 11. That incident was quickly followed by another for Eugene Laverty (Pull&Bear Aspar Team) at Turn 6 – with Jack Miller (Estrella Galicia 0,0 Marc VDS) heading off to complete the drama-fuelled session. With attrition rates high, it was the reigning Champion who emerged fastest from the day, as the 2009, 2013 and 2014 winner at the track took over at the top in the final shootout. 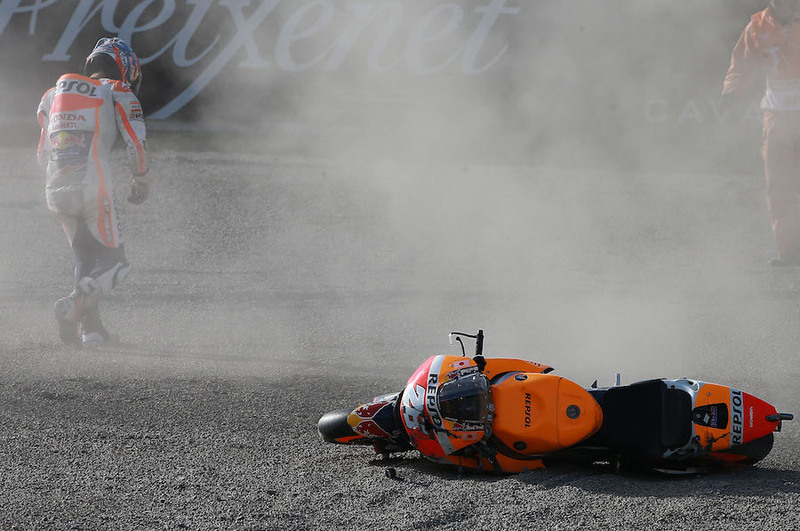 Laverty and Pedrosa were taken to the Medical Center for checks following the two incidents, with Pedrosa then diagnosed with a broken right collarbone. The break marks another unlucky injury in the 3-time World Champion’s career, with Pedrosa beginning the 2016 season back to full strength following career-saving forearm surgery in 2015. Former 250 World Champion Hiroshi Aoyama will ride in place of the Spaniard for the Japanese GP – his home race. After Ducati Team’s Andrea Dovizioso led the way in FP1 at the Twin Ring Motegi, skies remained perfectly blue above the Japanese track as the engines fired up once more for MotoGP™ – with Jorge Lorenzo (Movistar Yamaha MotoGP) topping the timesheets from Dovizioso and Team Suzuki Ecstar’s Maverick Viñales.